Next to steep cuts in greenhouse gas emissions, the removal of CO2 from the atmosphere is essential to keep average global temperature increases to 1.5°C, and well below 2°C. At this point in time, there is effectively only one realistic and sustainable way to help remove large amounts of CO2 from the atmosphere: restoring degraded forests. A strong and reliable governance framework is a pre-condition to restore degraded forests at the necessary scale. A new Ecologic paper discusses how to design such a governance framework for the EU. The paper is available for download. 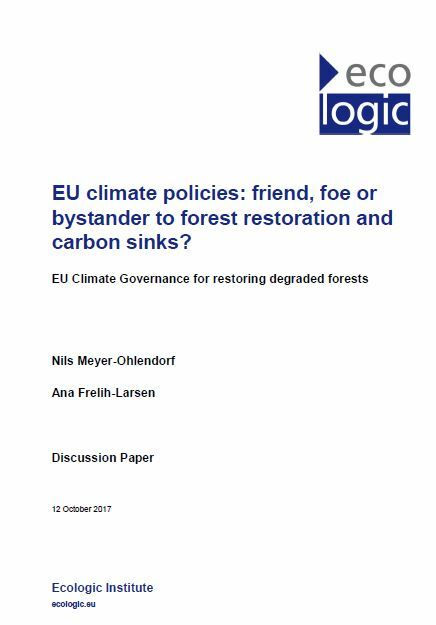 Meyer-Ohlendorf, Nils; Ana Frelih-Larsen (2017): EU climate policies: friend, foe or bystander to forest restoration and carbon sinks? EU Climate Governance for restoring degraded forests. Ecologic Institute: Berlin. 2.2 National targets or Member State pledges to contribute to EU targets?